Part 7 of the ongoing La Scena series was published in the print version in French only, so the English text is reproduced in full below. Both versions are also available for download in PDF format here. IT’S 35˚C IN THE TOWNSHIP gymnasium north of Cape Town, South Africa, but the bass-baritone is doing a very credible job of the Frost Scene in Henry Purcell’s King Arthur. As he sings about “rising from beds of everlasting snow,” a massive chorus of township schoolchildren emerges, flash-mob style, singing “We chatter chatter chatter” in reasonable facsimile of a shiver, while sweating profusely in school uniforms. This is el Sistema at the southernmost tip of Africa. 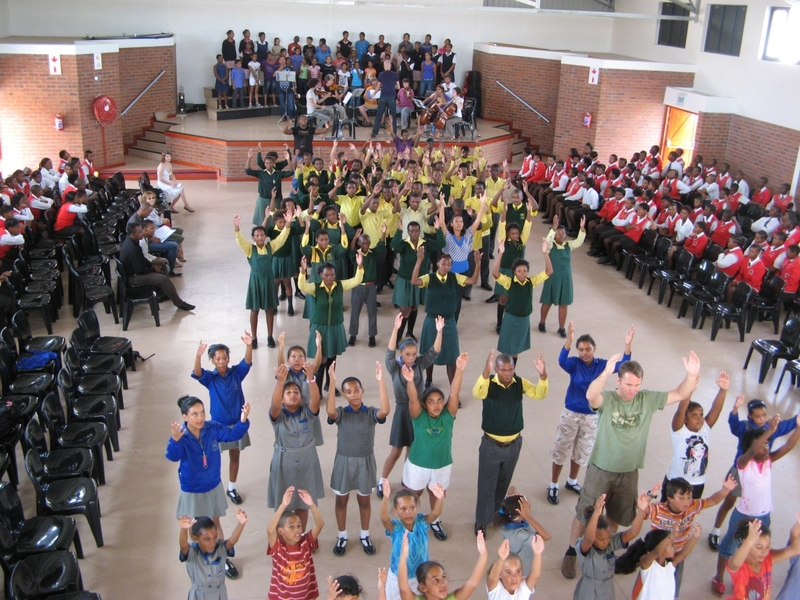 It’s an extraordinarily ambitious idea: to capitalize on the wealth of existing choral activity in South Africa, bring artists from across the world and the nation to collaborate in an opera, and to create enriching musical experiences for the first generations to be born outside the atrocity of institutionalized racism. It’s not just ambitious, it’s successful, despite all the tribulations of last-minute cancellations and logistical problems one might expect at the Met. Shirley Apthorp, the festival founder and director, is a highly distinguished music critic in Europe, writing for the Financial Times, but in South Africa she’s a concerned citizen and entrepreneur. On the other side of the Atlantic, a youth orchestra is rehearsing Chopin’s Piano Concerto No. 2 for a performance at Royal Festival Hall, UK, with pianist Lang Lang. No, it’s not a Venezuelan group, but an ensemble from the Sistema program Neojibá in Salvador, Brazil. Following Abreu’s original strategy, the núcleo first created an excellent orchestra, to build credibility and public trust, and then expanded to include outreach satellite modules. In only five years the orchestra has emerged as the foremost artistic ambassador of the state, to the chagrin of the local professional ensemble. Until recently the two groups shared a conductor in Ricardo Castro, the eminent pianist and laureate of the Leeds Competition, but now Ricardo devotes all his attention in Salvador to Neojibá.